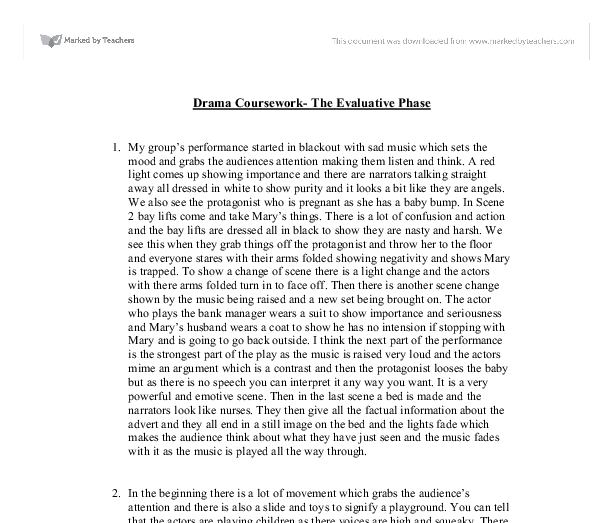 Drama Coursework- The Evaluative Phase 1. 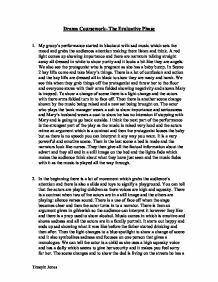 My group's performance started in blackout with sad music which sets the mood and grabs the audiences attention making them listen and think. A red light comes up showing importance and there are narrators talking straight away all dressed in white to show purity and it looks a bit like they are angels. We also see the protagonist who is pregnant as she has a baby bump. In Scene 2 bay lifts come and take Mary's things. There is a lot of confusion and action and the bay lifts are dressed all in black to show they are nasty and harsh. We see this when they grab things off the protagonist and throw her to the floor and everyone stares with their arms folded showing negativity and shows Mary is trapped. To show a change of scene there is a light change and the actors with there arms folded turn in to face off. ...read more. 2. In the beginning there is a lot of movement which grabs the audience's attention and there is also a slide and toys to signify a playground. You can tell that the actors are playing children as there voices are high and squeaky. There is a contrast when two of the actors are in a still image and the others are playing: silence verses sound. There is a use of face off when the stage becomes clear and then the actor turns in to a narrator. There is then an argument given in gibberish so the audience can interpret it however they like and there is a prop used to show alcohol. Music comes in which is emotive and shows sadness and all the actors are in a family portrait. It starts out happy and ends up sad showing what it was like before the father started drinking and then after. Then the light changes to a blue spotlight to show a change of scene and it also symbolizes sadness and focuses on one person that gives a monologue. ...read more. I think I just judged them because they looked different and lived a very different life to what I did. Now I have learnt about homeless people I realise that they aren't scary and are just the same as me. If I see someone homeless on the streets I feel sorry for them and I think this is because I didn't really no why they were living on the streets. I think I just assumed they were all drug addicts but now I no there are lots of different reasons why people live on the streets and I have learnt that there are all types of homeless people. Now if I see someone I would give them some of my extra change if they needed it because I feel so lucky to live in a house and have a nice bed to sleep in and all they have our the clothes on my back. I think I would feel really happy if I had helped a homeless person out if even just a little bit. ?? ?? ?? ?? Timeyin Jones ...read more. At last the child wakes up so me and Chantelle plays around with by squeezing its cheeks. This makes the baby cry and because of the reason that we have no idea of how to stop it cry it got out of control. movement to show who was speaking and they all adapted very well to their character. I don't think their was much emotion in certain characters voices for example when the news is heard of king Duncan being killed, Macduff should really be devastated but he doesn't really put enough emotion in his voice to show this. We then returned to Moseley Old Hall and drew out a birds-eye view of the venue similar to that of appendix 1. The route we would take was decided by the structure of the episodes. The route is drawn in red pen on the birds-eye map shown in appendix 1. Our main strength was that we always reached on time at our said location and waited endlessly, sometimes two hours for the actors to turn up. We did stick together till the end but I feel that we had a bit of a misunderstanding and one major argument, which have now been cleared out.